Apparently, there are more "quattroholics" in the world than we originally had thought. Audi reports today that with 316,824 vehicles built with quattro all-wheel drive in 2009, "no other premium car manufacturer sells as many vehicles with all-wheel drive throughout the world as does Audi." Leading the pack of quattro-equipped Audis is the Q5, boasting 109,117 units produced. Full press release after the jump. No other premium car manufacturer sells as many vehicles with all-wheel drive throughout the world as does Audi. Last year the Ingolstadt-based carmaker built 316,824 cars with quattro drive. This means that around a third of all the Audi cars leaving the factory in 2009 were equipped with this successful technology. 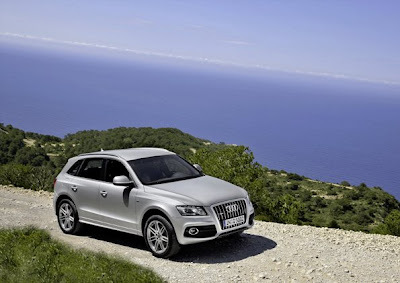 Top seller among the all-wheel-drive models last year was the Audi Q5, with 109,117 produced. In Germany, too, Audi’s quattro drive has outperformed its competitors. The brand delivered 72,049 all-wheel-drive vehicles to customers in 2009 and thus took first place in the premium segment. In the year in which quattro celebrated its thirtieth anniversary, two Audi models won the “All-Wheel-Drive Car of the Year” poll. Readers of “AUTO BILD ALLRAD” voted the Audi A4 quattro and the Audi A8 top of their categories. Michael-Julius Renz, Head of Sales Germany at AUDI AG, was presented with the award on Thursday evening at an event held during the AMI show in Leipzig. It was the fifth year in succession that the prize had gone to the Ingolstadt-based company. The spotlights went on to showcase the first Audi quattro on March 3, 1980 at the Geneva Motor Show. A series of motorsport victories began, and the success of this all-wheel-drive system on both road and track was assured. Today, it is still one of the manufacturer’s core competences and a major element in the Audi model initiative.